some of the most exciting seasons in baseball memory. To mark the 100th anniversary, one of baseball's most remarkable team's meets one of the country's most respected newspapers in an an authoritative, colorful history. Five outstanding sports journalists of The New York Times have written original chapters that cover the Yankee saga in fine detail and revealing anecdote. Along with 150 (CK) photographs from the library of the Baseball Hall of Fame and The Times's own extensive archives the combination is a uniquely thorough and engrossing story of the Yankee century-truly a book that lives up to the unbeatable record. With decades of experience, award-winning sports journalists Dave Anderson, Murray Chass, Robert Lipsyte, Buster Olney, and George Vescey, provide a shrewdly informed perspective on the Yankees and their place in the annals of baseball. 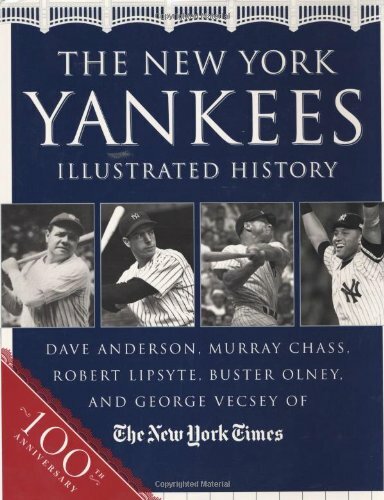 Through the stories and photographs of the New York Yankees Illustrated History fans can enjoy-once again or for the first time---the many unforgettable moments in Yankee history of the game and the legendary players who made them happen. With great reporting and fine writing, this beautiful book is the perfect gift for every baseball lover.